Claiming 2018’s NHRA championships were J.R. Todd, Tanner Gray, Matt Smith and Steve Torrence. Todd clinched his first career Mello Yello Drag Racing Series Funny Car title during the opening round of eliminations when point-runner-up Robert Hight lost his match against Bob Tasca III. Smith secured his third Pro Stock Motorcycle championship since 2007 with a final-round victory over arch-rival Eddie Krawiec. And Torrence _ who wrapped up his first Top Fuel championship two weeks ago in Las Vegas _ completed an historic sweep of all six Countdown to the Championship playoff races with his event victory against Tony Schumacher. Todd, Smith and Torrence were joined in Victory Circle at the famed Southern California facility by Tanner Gray, the newly-minted Pro Stock world champion. 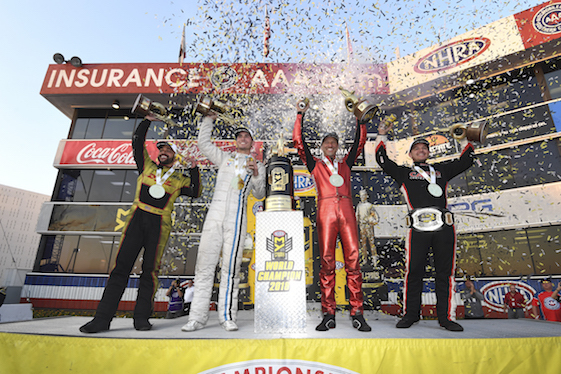 It marked the first time in NHRA history that all four event-winners also were world champions in their respective categories. Todd, of Kalitta Motorsports, defeated Tommy Johnson Jr. of Don Schumacher Racing in the Funny Car final to cap a day that began with Hight’s tire-smoking opening-round loss to Tasca. Todd defeated Jim Campbell and Tasca in the first two rounds before dispatching 2016 world champ Ron Capps in the semifinals to set up his final-round match with Johnson. In that final, Todd posted an 0.006-second reaction time advantage at the Christmas Tree and never trailed as he and a Toyota Camry registered the day’s quickest time with a 1,000-foot pass in 3.872-seconds at 329.10 mph. Todd’s final margin of victory of 0.023-seconds/11-feet. “People kept asking, ‘What do you need to do to clinch? I’m like, ‘We need to win the race,’^” said Todd, the first African-American driver to win a Funny Car championship and just the second African-American driver (Antron Brown) to win a major U.S. auto racing title. “Seeing Robert smoke the tires first round was instant relief. “The DHL Toyota guys are great at what they do. (Co crew-chiefs) Todd Smith and Jon Oberhofer really have a handle on the tune-up. They were almost calling their shots today. In the finals, I had it way out of the groove, driving like an idiot. I thought for sure I was going to smoke the tires. Then the win light came on and I thought to myself, ‘You’ve got to be kidding me!’ and then to see that we ran an 0.87. That was a big-time run. They just have a really good handle on the car, racing smart. The ‘Yella Fellas’ just do a great job of preparing our Camry. They definitely stayed focused with a lot of distractions around our pit area. The victory was Todd’s third in the Countdown playoffs. A 36-year-old native of Lawrenceburg, Ind., Todd advanced to the finals in five of six playoff races. Overall, the second-year Funny Car driver won a series-leading six races and posted a 44-18 win/loss record for the season. He became the third Toyota Funny Car driver to win a world championship since 2008. Todd finished 304 points in front of Hight. Hight, the two-time/outgoing world champion from John Force Racing, began the day 72 points/three-plus rounds of racing behind Todd. Hight’s slim title hopes ended when his Chevrolet Camaro SS smoked its tires at the throttle hit en route to a pass of 5.383-seconds and 143.86 mph. The result relegated Hight to second in points for the third time in his pro career. It also marked his 10th top-five finish in 14 pro seasons. “First, congratulations to J.R. Todd and that DHL team,” Hight said. “We gave them a run for the money but we just came up two races short. We controlled our destiny in Las Vegas and today. We just didn’t get it done. We had a great season and won races but we wanted another championship. We had a plan for the first round and it didn’t work out. I think we saw that the left lane really wasn’t that good. We were aggressive but we needed to be quick to get lane-choice. “There are so many Funny Car teams that are elite and we’re in that mix. I think we defended our championship well and we’ll start working on the 2019 championship tomorrow.” Hight and his team earned four event wins this season, boosting his career total to 45, third-all time behind only team-owner/16-time world champion “Brute” Force and DSR’s Capps. Smith _ who celebrated his 36th birthday Sunday _ secured his latest Pro Stock Bike championship in the final round of eliminations. Smith powered his Elite Motorsports EBR down the quarter-mile in 6.765-seconds at 201.22 mph _ the new national speed record _ to defeat Krawiec. The four-time/outgoing world champ, Krawiec and his Screamin’ Eagle Vance & Hines Harley-Davidson Street Rod were the last of six contenders who began the weekend with a shot at the title. Smith defeated wife Angie Smith, 2009 world champion Hector Arana and 2010 world champ LE Tonglet en route to the final. Smith, who finished 39 points ahead of Krawiec, scored his previous titles in 2007 and 2013. “Man, we went through a lot today,” said Smith, alluding to a broken air line in the first round against his wife. “In the second round the transmission broke on us going through the lights. My guys did their job and we fixed all of the stuff that broke and ended up putting up three 200 mph runs today. We’re having the time of our lives right now though.” Smith became the third member of the 200 MPH Club Friday during qualifying with a pass at 200.65 mph. A native and resident of King, N.C., Smith’s championship season featured four race victories including three wins during the Countdown. Smith also secured five No. 1 qualifiers and one runner-up finish. In Top Fuel, Torrence made NHRA history by sweeping all six playoff races. Torrence wheeled his Torrence Racing dragster to a hole-shot 1,000-foot win of 3.702-seconds at 330.07 mph against Schumacher _ an eight-time world champ and NHRA’s winningest Top Fuel driver _ who ran 3.700 at 331.61. Torrence earned his 11th win of the season, 27th of his career and first at Auto Club Raceway at Pomona. Torrence’s path to victory included wins against Cameron Ferre, teammate and father Billy Torrence and 2017 world champion Brittany Force. Schumacher took out Scott Palmer, Rookie of the Year candidate Bill Litton and Blake Alexander before falling to Torrence in the final. Torrence, who finished a massive304 points ahead of “The Sarge,” closed the season winning 24 consecutive rounds of racing in NHRA’s premier class. Teen-ager Gray won the Pro Stock portion of the event in his Chevrolet Camaro SS with a quarter-mile run of 6.519-seconds at 211.86 mph to defeat Drew Skillman’s pass of 6.524 at 211.03. The 2018 world champion notched his eighth victory of the season, 13th of his two-year career and first at the Auto Club NHRA Finals. Gray, who finished 187 points in front of Jeg Coughlin Jr., will not defend his NHRA title as he moves onto a NASCAR career beginning in 2019. Gray drove past his father Shane Gray, two-time world champ Erica Enders and three-time champion Jason Line before entering his second consecutive final round appearance at the event. Skillman defeated Alan Prusiensky, four-time world champ Greg Anderson and No. 1 qualifier/five-time world champ Coughlin before falling in the final. The 2019 NHRA Mello Yello Drag Racing Series season will begin in 88 days with the 59th annual Lucas Oil NHRA Winternationals Feb. 7-10 at Auto Club Raceway at Pomona. Top Fuel _1. Steve Torrence; 2. Tony Schumacher; 3. Brittany Force; 4. Blake Alexander; 5. Billy Torrence; 6. Clay Millican; 7. Antron Brown; 8. Bill Litton; 9. Doug Kalitta; 10. Mike Salinas; 11. Scott Palmer; 12. Richie Crampton; 13. Shawn Reed; 14. Terry McMillen; 15.Cameron Ferre; 16. Leah Pritchett. Funny Car _ 1. J.R. Todd; 2. Tommy Johnson Jr.; 3. Jack Beckman; 4. Ron Capps; 5. Courtney Force; 6. Bob Tasca III; 7. Shawn Langdon; 8. John Force; 9. Cruz Pedregon; 10. Matt Hagan; 11. Tim Wilkerson; 12. Bob Bode; 13. Robert Hight; 14. Jeff Arend; 15. Jim Campbell; 16. Ray Martin. Pro Stock _1. Tanner Gray; 2. Drew Skillman; 3. Jason Line; 4. Jeg Coughlin Jr.; 5. Bo Butner; 6. Greg Anderson; 7. Alex Laughlin; 8. Erica Enders; 9. Chris McGaha; 10. Shane Gray; 11. Deric Kramer; 12. Fernando Cuadra; 13. Vincent Nobile; 14. Matt Hartford; 15. Alan Prusiensky; 16. Kenny Delco. Pro Stock Motorcycle _ 1. Matt Smith; 2. Eddie Krawiec; 3. Hector Arana Jr.; 4. LE Tonglet; 5. Andrew Hines; 6. Hector Arana; 7. Jerry Savoie; 8. Angelle Sampey; 9. Chip Ellis; 10. Scotty Pollacheck; 11.Ryan Oehler; 12. Karen Stoffer; 13. Steve Johnson; 14. Joey Gladstone; 15. Freddie Camarena; 16. Angie Smith. Top Fuel _Steve Torrence, 3.702-seconds, 330.07 mph def. Tony Schumacher, 3.700-seconds, 331.61 mph. Funny Car _J.R. Todd, Toyota Camry, 3.872, 329.10 def. Tommy Johnson Jr., Dodge Charger, 3.889, 327.51. Pro Stock _Tanner Gray, Chevy Camaro, 6.519, 211.86 def. Drew Skillman, Camaro, Foul/Red Light. Pro Stock Motorcycle _Matt Smith, EBR, 6.765, 201.22 def. Eddie Krawiec, Harley-Davidson, 6.812, 198.35. Top Alcohol Dragster _James Stevens, 5.281, 275.17 def. Julie Nataas, 5.402, 271.19. Top Alcohol Funny Car_ Shane Westerfield, Chevy Camaro, 5.446, 271.30 def. Ulf Leanders, Camaro, 6.120, 249.72. Competition Eliminator _David Rampy, Bantam Roadster, 8.318, 112.44 def. Doug Lambeck, Pontiac Sunfire, Foul/Red Light. Super Stock_ Steve Wann, Plymouth Fury, 9.782, 131.39 def. Gary Emmons, Ford Mustang, 8.780, 156.08. Stock Eliminator_Jeff Taylor, Chevy Camaro, 9.267, 143.51 def. Ryan Mangus, Camaro, Foul/Red Light. Super Comp _Chad Webber, Dragster, 8.916, 164.51 def. Tony Helms, Dragster, 8.942, 176.03. Super Gas _Roger Kato, Chevy Cavalier, 9.945, 174.98 def. Greg Ventura, Chevy Nova, 9.897, 144.03. Summit Super Pro_ Pat Oswmundson, Dragster, 8.806, 169.53 def. Jeremy Hancock, Dragster, 7.087, 182.38. Summit Pro _Nelson Belot Jr., Olds Cutlass, 9.037, 148.46 def. Dustin Loynes, Pontiac Firebird, 9.756, 132.43. Summit Sportsman_ Brian Hendrickson, Dodge Demon, 12.556, 105.72 def. Brent Erickson, Dodge Dart, 12.096, 108.02. Summit Pro Bike_ John Markham, Razor, 8.764, 145.69 def. Jeremy Hicks, Busa, 8.115, 151.73. FINAL _ S. Torrence, 3.702, 330.07 def. Schumacher, 3.700, 331.61. FINAL _Todd, 3.872, 329.10 def. Johnson Jr., 3.889, 327.51. FINAL _T. Gray, 6.519, 211.86 def. Skillman, Foul/Red Light. Top Fuel _1. Steve Torrence, 2,900; 2. Tony Schumacher, 2,596; 3. Clay Millican, 2,573; 4. Leah Pritchett, 2,456; 5. Brittany Force, 2,417; 6. Antron Brown, 2,378; 7. Mike Salinas, 2,308; 8.Doug Kalitta, 2,308; 9. Terry McMillen, 2,301; 10. Scott Palmer, 2,231. Funny Car _1. J.R. Todd, 2,726; 2. Robert Hight, 2,532; 3. Tommy Johnson Jr., 2,519; 4. Ron Capps, 2,510; 5. Tim Wilkerson, 2,418; 6. Courtney Force, 2,409; 7. Jack Beckman, 2,405; 8. Matt Hagan, 2,371; 9. John Force, 2,356; 10. Shawn Langdon, 2,285. Pro Stock _1. Tanner Gray, 2,758; 2. Jeg Coughlin Jr., 2,571; 3. Drew Skillman, 2,559; 4. Erica Enders, 2,525; 5. Jason Line, 2,472; 6. Vincent Nobile, 2,452; 7. Greg Anderson, 2,418; 8. Bo Butner, 2,379; 9. Deric Kramer, 2,268; 10. Chris McGaha, 2,184. Pro Stock Motorcycle_1. Matt Smith, 2,666; 2. Eddie Krawiec, 2,627; 3. Hector Arana Jr., 2,536; 4. LE Tonglet, 2,532; 5. Jerry Savoie, 2,464; 6. Andrew Hines, 2,450; 7. Angelle Sampey, 2,349; 8. Angie Smith, 2,303; 9. Steve Johnson, 2,290; 10. Scotty Pollacheck, 2,258.